The Center for Popular Democracy (CPD), a New York-based nonprofit consisting of old chapters of the controversial and now-defunct Association of Community Organizations for Reform Now (ACORN), and Make the Road New York (MRNY), a group whose 19,000 dues-paying members are primarily Latino immigrants, have partnered to "name and shame" companies the groups say are working with Trump or "profiting" from his "anti-immigrant, anti-worker" platform, Time magazine first reported. The campaign, known as "Corporate Backers of Hate," targets nine companies: JPMorgan Chase, Wells Fargo, Goldman Sachs, Boeing, Disney, IBM, BlackRock, Uber, and Blackstone. Individuals from the groups researched the personal email address of every CEO and board member included in the list of targeted companies to allow activists to bypass lower channels and send emails directly to the top. Corporate responsibility experts told Time that the "mass lobbying" campaign is unprecedented and that they had never heard of these tactics being employed in the past. Organizers say the targeted companies could benefit from Trump's stricter immigration policies due to their ties to immigrant detention companies and private prisons. Time‘s piece describes the Center for Popular Democracy and Make the Road New York as having "partnered" for the campaign. However, the groups' leadership and flow of funds show that their connections go beyond a mere campaign partnership. Andrew Friedman, a co-executive director of the Center for Popular Democracy, co-founded Make the Road New York in 1997. Friedman spent 15 years building up that organization before moving to the Center for Popular Democracy. Friedman currently serves on the board of Make the Road and Make the Road Action Fund. Ana Maria Archila, also co-executive director at the Center for Popular Democracy, served as co-executive director of Make the Road before joining the Center for Popular Democracy. Javier Valdes, the co-executive director of Make the Road, is the board chair of the Center for Popular Democracy. George Soros is one of the largest funders to the CPD. Soros provided the CPD with $130,000 from the Foundation to Promote Open Society in 2014 and $1,164,500 in 2015. Soros provided an additional $705,000 from the Open Society Policy Center in 2016. Make the Road published a list of its grantors in 2010 that showed they received funds from Soros' Open Society Foundations. The following year, the group's annual report showed that they received up to $700,000 from the Open Society Foundations. Marbre Stahly-Butts, a policy advocate at CPD, joined the group as a George Soros Justice Fellow in 2013. Hundreds of thousands in funds have also been passed between the two organizations. Make the Road gave a $122,112 grant to the Center for Popular Democracy in 2013. The group passed $25,000 to the CPD in 2014. In 2014, the CPD gave a $100,000 grant to the Make the Road Action Fund and a $253,900 cash grant was given to MRNY. The CPD gave a $286,042 grant to MRNY in 2015. Make the Road has also received millions in government grants. Recent pressure campaigns from progressive groups have proven to be successful. 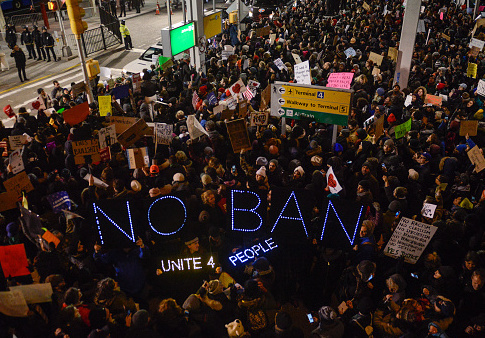 Make the Road was reported to have organized the "spontaneous" protests at New York's JFK airport and other airports across the country after President Trump announced the Muslim travel ban. The protests, however, had been planned since the day after the presidential election, the Daily Beast reported. The outrage led to progressives zeroing in on Uber, which had continued to pick up passengers from the airport. The #DeleteUber campaign led to thousands of users deleting the app. Uber's CEO, Travis Kalanick, stepped down from Trump's advisory council after mounting pressure. The #GrabYourWallet campaign targeting retailers who carry Trump-family products was successful in getting Nordstrom to pull Ivanka Trump's products. The store claimed it dropped her brand due to declining sales. The Center for Popular Democracy and Make the Road did not return requests for comment on their operations and funding by press time.